Lucas Duda delivered the fatal blow in the seventh with a pinch-hit driving in the go-ahead run as the Braves defeated the Phillies 8-3 on Thursday night at SunTrust Park in Atlanta. The loss leaves the Phillies 6 1/2 behind the Braves in the NL East pennant race, a nearly unconquerable ask with ten games remaining on the schedule. Thursday's defeat seemed to be a microcosm of the 2018 season. A pair of defensive miscues in the first inning allowed the Braves to plate two runs early. Over the next eight innings a passed ball, a dropped foul down the left field line, a wild pitch, and a hard hit ball up the middle that should have been handled gave the Braves more opportunities than they needed to put the Phillies away. The defense was a back-breaker. Dansby Swanson doubled to left in the seventh on a ground ball that Aaron Altherr took a circuitous route to pick up. The extra steps he took to ensure it didn't scoot by him allowed Swanson to turn what looked to be a single into a double. Duda then ripped a Tommy Hunter cutter to right to score Swanson and ultimately give the Braves the victory. 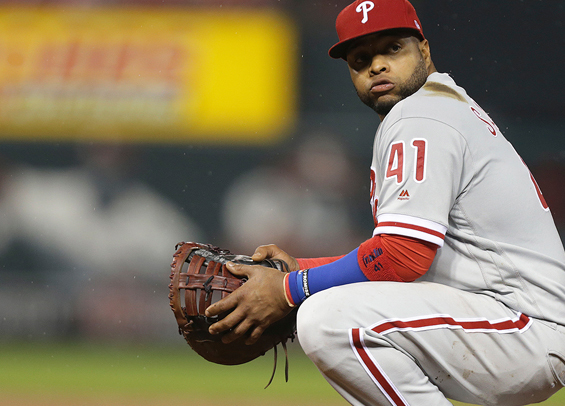 Luis Garcia was hit around in the eighth, surrendering four runs as the game spiraled out of control for the Phillies. Kapler said afterward he felt Garcia was the go-to guy to face the bottom of the Braves' order. It just didn't pan out as he planned. The win trimmed the Braves magic number to four, leaving the Phillies in a position where they have to win the final three games of this series and hope for some serious luck during the final week of the season before the two clubs reconvene next weekend at Citizens Bank Park. It's a tall order, so Kapler wants to think a game at a time right now. "I don't think we think about that right now," Kapler said afterward. "The most important thing is we did not execute winning tonight's ballgame. That puts us in a position where we need to come out and win tomorrow's ballgame."